Single rooted arrows are progressing into multi directions. These arrows made me a search on Turkey’s entry to NATO in relation to Greek-Turkish relations over the years. 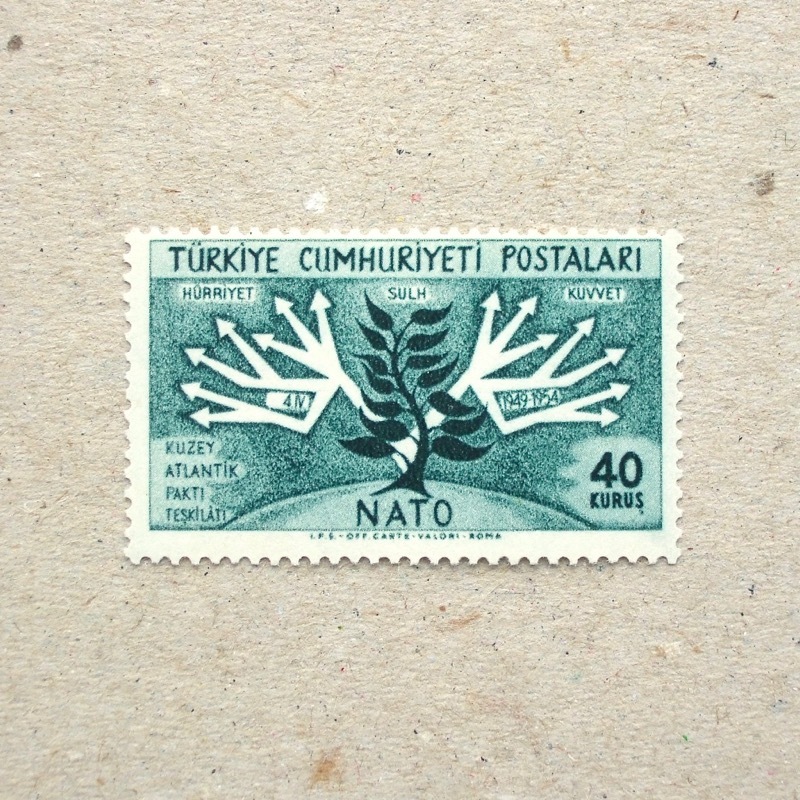 By the design of this stamp, we can read that they were willing to grow this relationships with European and North American countries. Radio antenna system standing ( oh, is it still there? ) on the Zugspitze, a mountain on the border between Austria and Germany. Beautifully engraved stamp, nice to look at to be chilled on a hot evening. The hand of God is giving Adam a human intelligence – a part of Michelangelo‘s huge fresco ceiling in the Sistine Chapel of the Vatican. 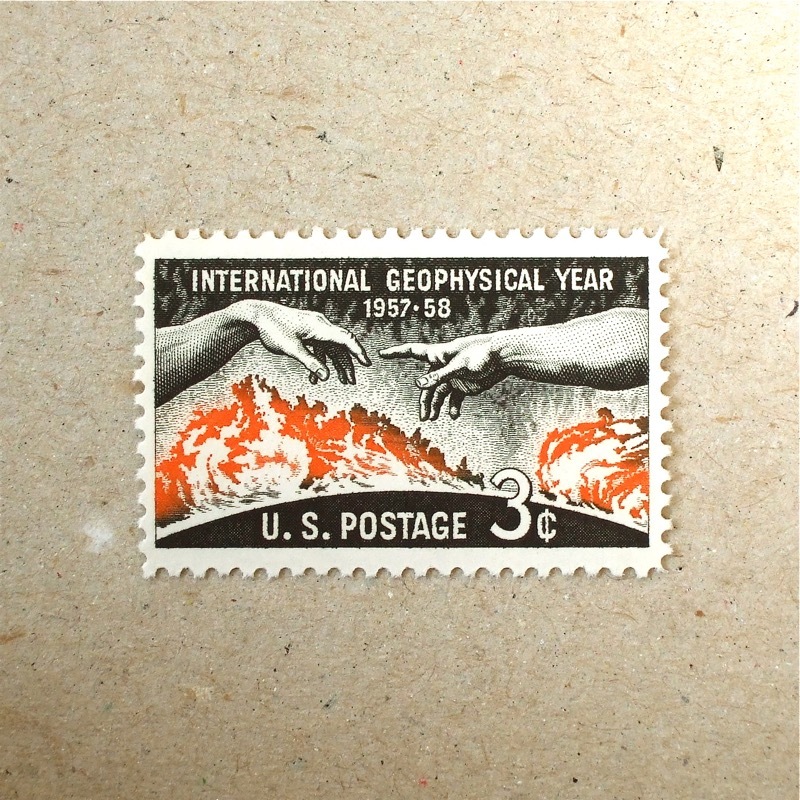 The background for this stamp is the burning surface of the sun, which could be the mother of the earth. When I read about Michelangelo’s life, I discovered that he was always angry because his life was affected by the change of rulers, and also what those rulers forced him to create. Well, 500 years later in our global era, we still have to be aware about what a ruler wants and how our life is influenced by that. I am imagining Michelangelo’s feeling when he painted this hand of God. 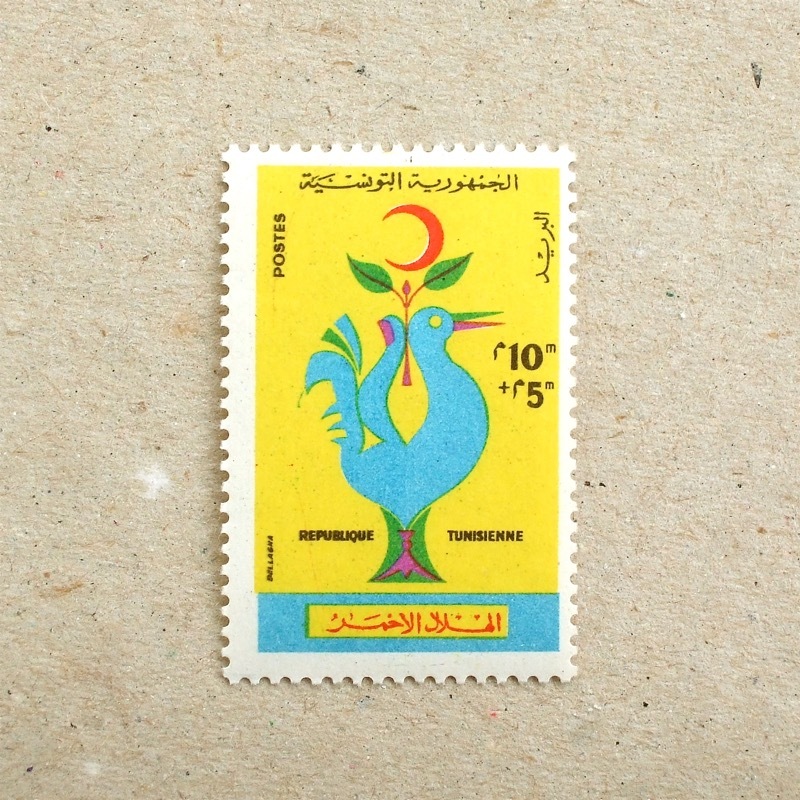 Tunisia was a part of France until 1956 and their stamps often show influences of French design. But this bright one, only three years after the independence, shows they are clearly developing in their own aesthetics. The blue bird looks fingers pinching a twig – thus categolised in ‘hand’. It is unfortunate but the country is recently opposite to this optimistic atmosphere. 300th Anniversary of the Treaty of Pyénées. The left is the French king – ‘fleur de Louis’ heraldry on red sleeve – and right is Spanish king with orange sleeve with ‘castle-leo’ heraldry. And this handshake had happened in 1659. The origin of handshake was to proof that there is no weapon in their hands – well, it was one condition before the friendship, really. Gutenberg invented ‘mobile’ letters which can be placed in a frame and set to make a page. He also developed alloys for the letter press, the formula of ink for the method, and adapted the farmer’s press device for printing… I imagine he might have worked hard. Mono and modest coloured stamp but strong – the atmosphere of a work place of 500 years ago is well presented within a small stamp. 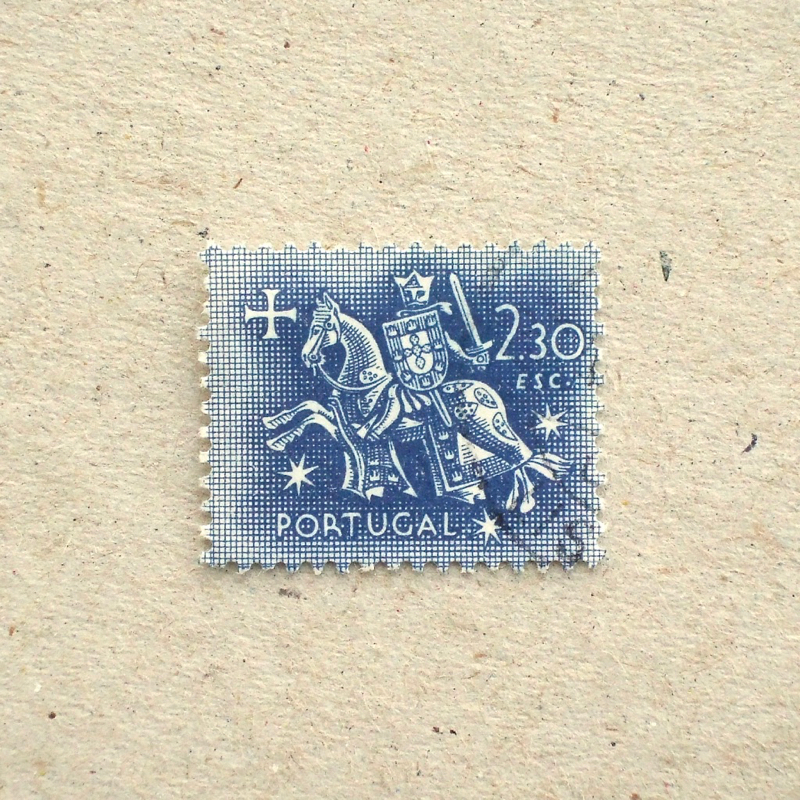 Not just bright colours, but quiet tint can be strong, if the stamp design is good. This elegant swirl adorns the number 1 – because the background is grey, white lines stand out beautifully. In 1609 an English ship was drifted to an island which was already named Bermuda after a Spanish navigator Juan de Bermudez, who reported about this uninhabited island in early 16th century. 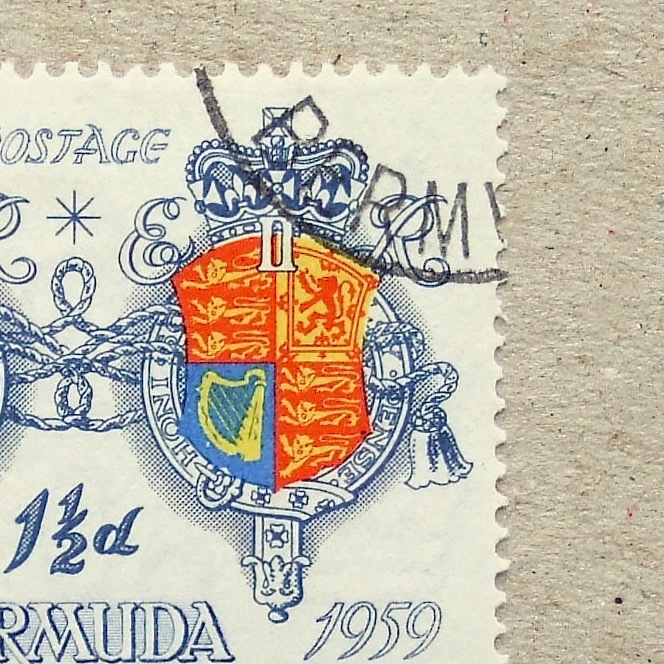 This stamp is celebrating this arrival of English people with two Royal heraldry in 1609 (King James I) and 1959 (Queen Elizabeth II). In spite of 300 years apart between then, there are not much difference. Well, the primitive patterns on battle shields in 1066 were quickly stylised to heraldry by 1189, when Richard I made the College of Arms, then has been staying similar until today. The ‘walking lions’ against red background was designed more than 900 years ago. 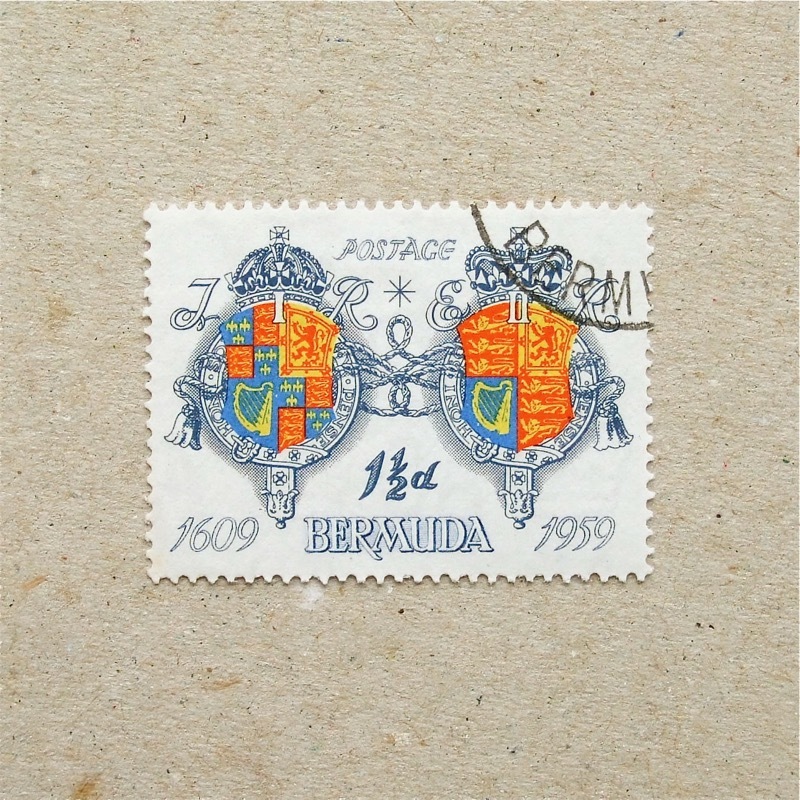 Another stamp of medieval knight – showing the seal of Denis of Portugal, a king of 13 – 14th century Portugal. I went to Milano furniture fair since I posted the last Swedish knight stamp two weeks ago, I am still in a feeling of wearing armour. I was worn out and slept almost two days after I return to home. 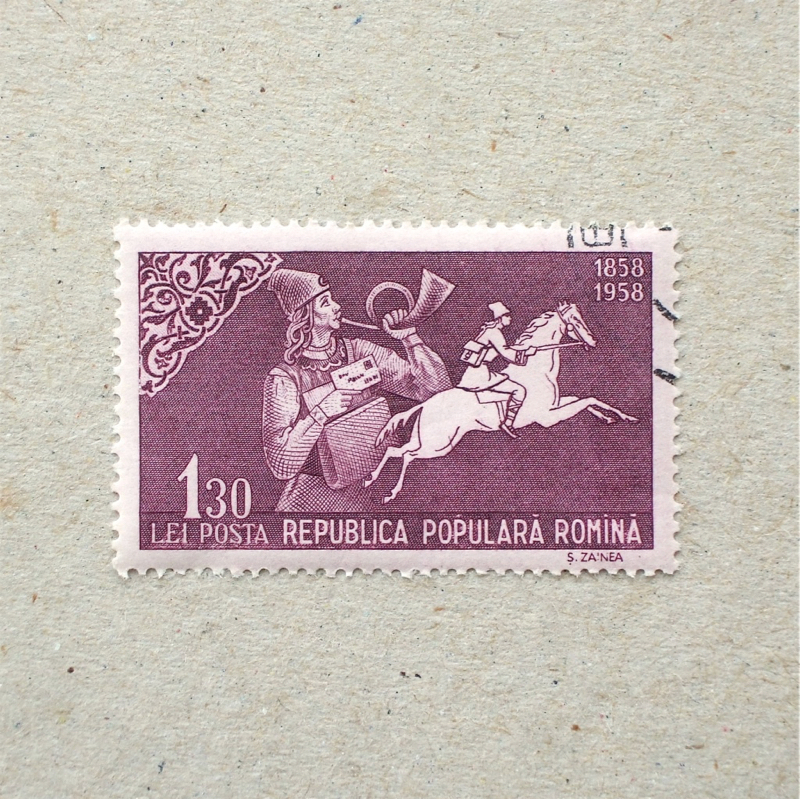 Celebrating 100 years of postage stamps – and the bugle horn and horse were the main delivery method still at that time. The Chinese calendar had just turned the year of the Horse – so, I am still featuring more stamps with horse. This German stamp is depicting the early postal service man on horse, who is blowing a bugle horn to ask if anyone has a letter to be delivered to a remote place. The horn became an icon of the postal services. One of the legendary creatures – Pegasus has reverential atmosphere suits to the New Year. The Greek mythology which tells us this creature has its roots goes back to 15th century B.C., visual materials are dated from 8~9 century B.C. – I have just learnt how old this creature was! The horses with wings in this stamp is claimed from Etruria, where one of the ancient civilizations was cultivated from 9th century B.C. in the centre of Italy. It was stormy day today and even at noon I needed a desk lamp to read. I imagined how dark the inside of a house was before electricity was invented – and even worse in parts further north than here in London. 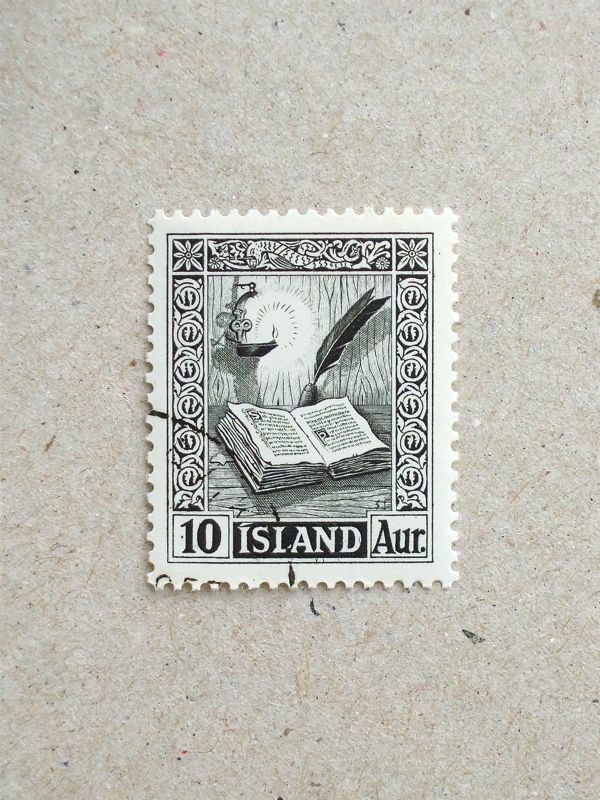 I found a candle light reading picture on an Icelandic stamp and the rumpled book is a manuscript from 14th century. Here in London we have the beginning of autumn colours, but the weather is already winter… I guess the southern Europe is still in sunshine and people are harvesting for a few more weeks. In Japan there is a saying ‘sky is high and horse will grow fat in autumn’ and in fact I was always gaining some weight in autumn, after the air cools down and my appetite came back. These illustrated vegetables are dynamic and thankful. 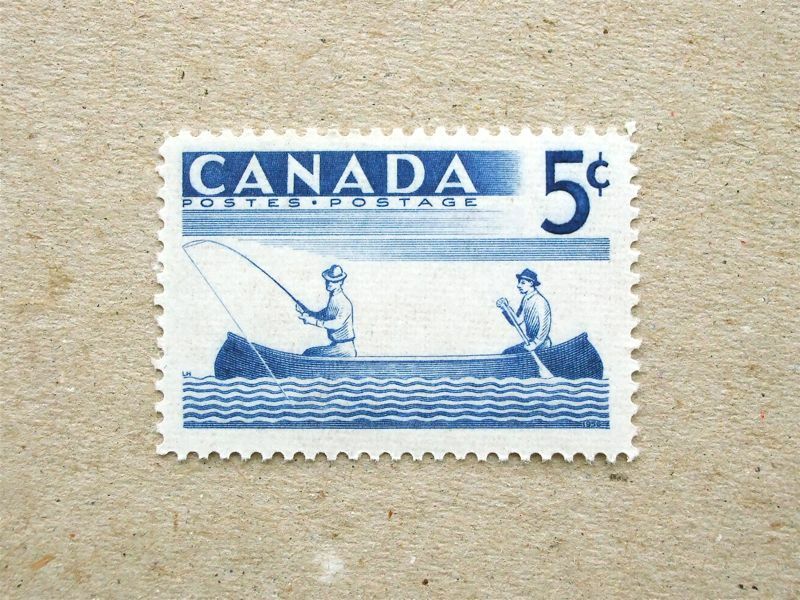 Another visual chill-out from Canada, where I found many cool stamps are from. The girl is having great time in the water! 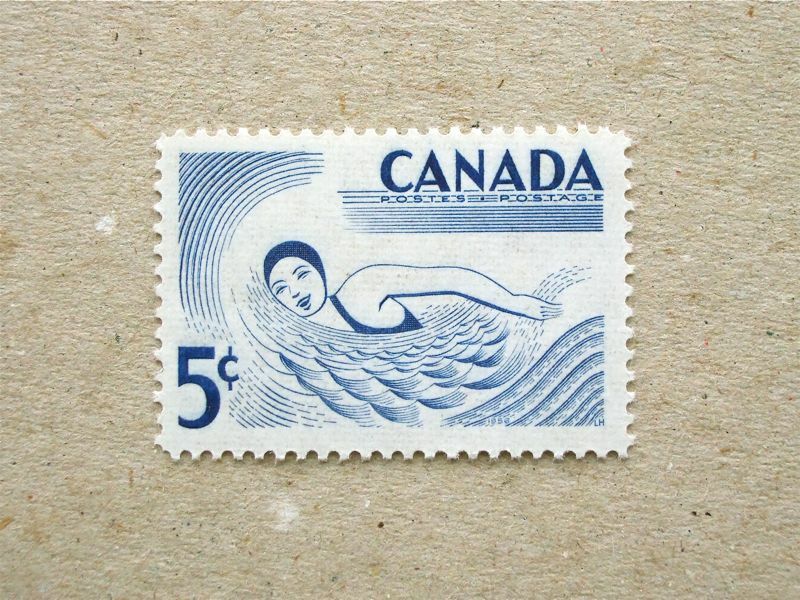 I like these crisply engraved single coloured stamps with geometrical expression of water. Today is the final stage of the Tour de France 2013 – post Armstrong ‘clean’ tour as well as the 100th edition. I have been supporting Nairo Quintana from Colombia since he made his great challenge in the mountain stages. He won a stage yesterday and became 2nd place in this years Tour. I always support the small built athletes in any sports – he is 166 cm high, 20 cm shorter than the winner Chris Froome! 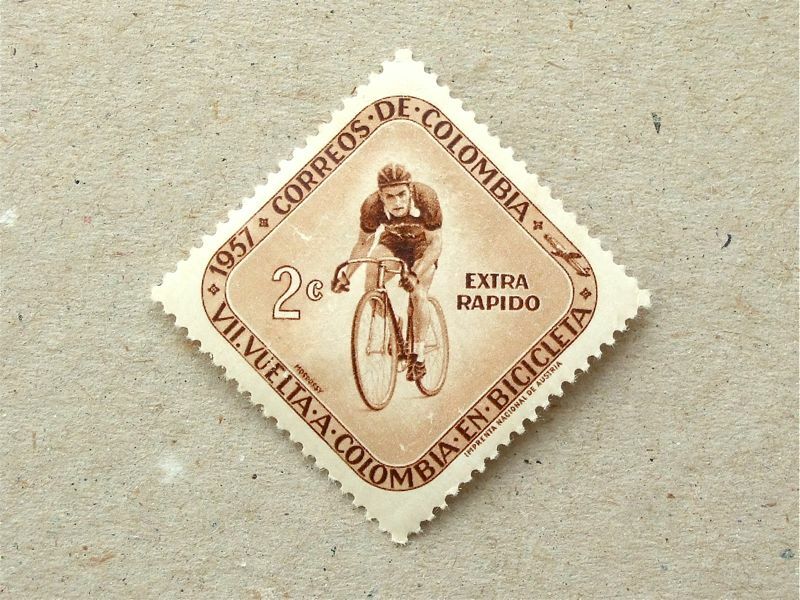 Colombia has a long history of cycling as this stamp tells us. Quintana might be the first Colombian winner of Tour de France in the coming years. Another abstract lattice tower which is dispersing wavy lines. This is a set of four stamps and each design commemorates a different method of communication. 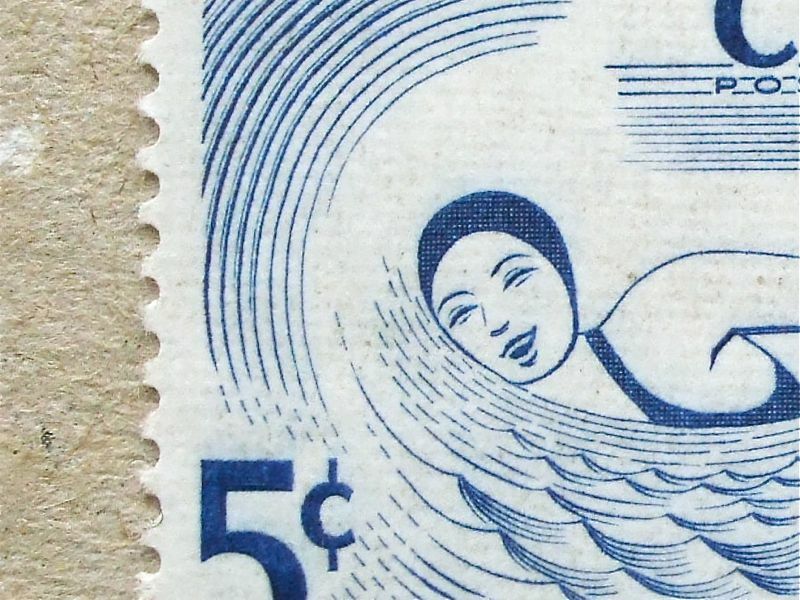 We get used to imagining our sky covered by communication networks, but 100 years before this stamp, it must have been a new concept to have invisible waves flying above us. After the Croatian QR code stamp, I remembered this one, in a similar layout with mysterious lines and dots. The centre picture is an early electrical telegraph receiver. In the top bar, between two small squares, are Japanese Morse code, which says ‘ko ku sa i’, which means ‘international’. 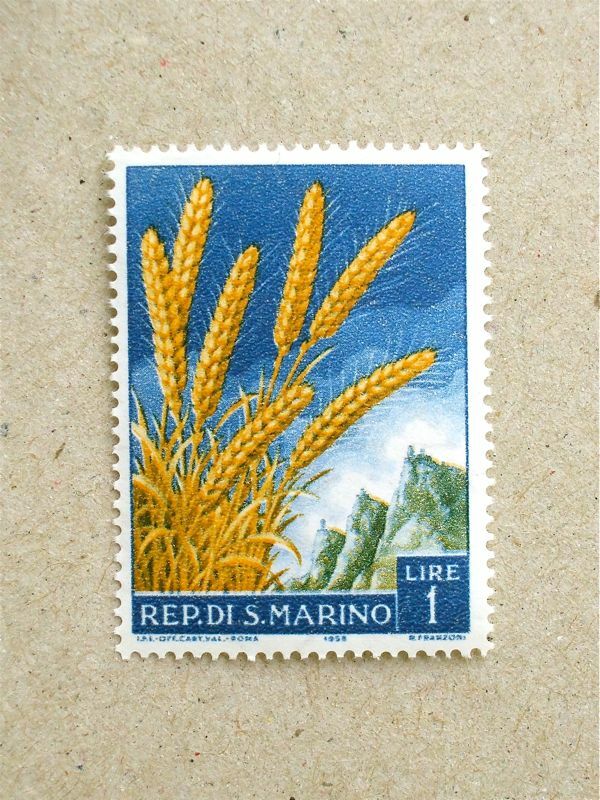 Although there is a similarity in the first impression between this and the QR code stamp in the previous post, this one has far higher density in its stamp design. I admire this old ‘stampness’ and joy of magnifying. I have seen two cars ignore the red traffic light and went over it, in one day… Even when we are living through a hectic December and dealing with all the things that this festive season brings , we really need to at least appreciate the traffic lights for the sake of other people’s safety! Earlier this month I encountered a number of attractive Italian stamps for the first time, at a nice philately-shop in Milano. 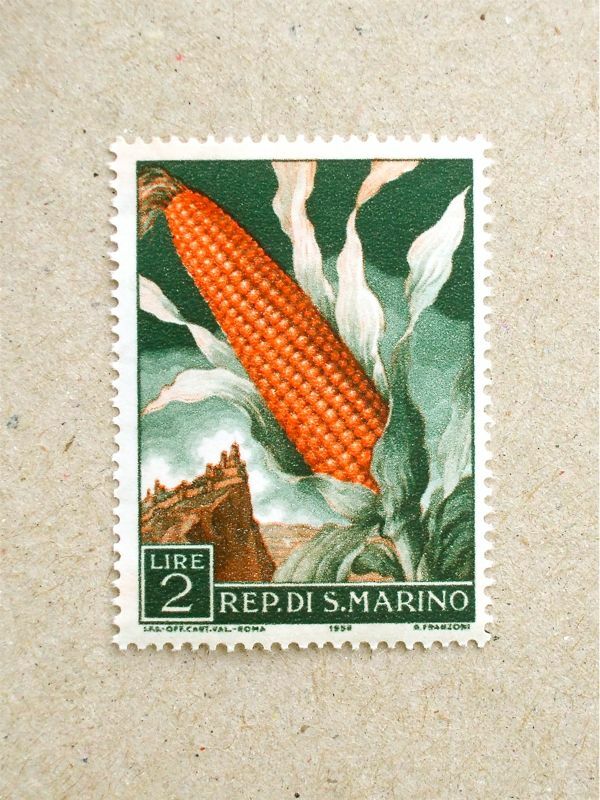 Only because I had not seen good ones before, I thought that most Italian stamps were boring – but I was wrong. This simple yet strong stamp tells me that I should get rid of my prejudice and visit local stamp shops anywhere I am able to.